Some mountains finally! Finalmente montanas! Tomorrow we enter Yellowstone … Finally! Wish us luck! I’m hoping for a bear! 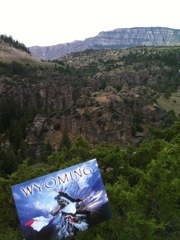 Mañana entramos a Yellowstone … Al fin! Yo espero ver un oso! Manden suerte! Que suerte. Felicitaciones y que puedas ver y fotear osos, alces y eso hermosos paisajes. !!!!! Our favorite place ….. Take some of the side roads through the park for great animal viewing. But remember, Yellowstone is as big as Rhode Island. We’re having a great time following your travels; thanks for the photos. Thanks for sharing the photos. Wait now till you get to Glacier national Park and the mountains there.